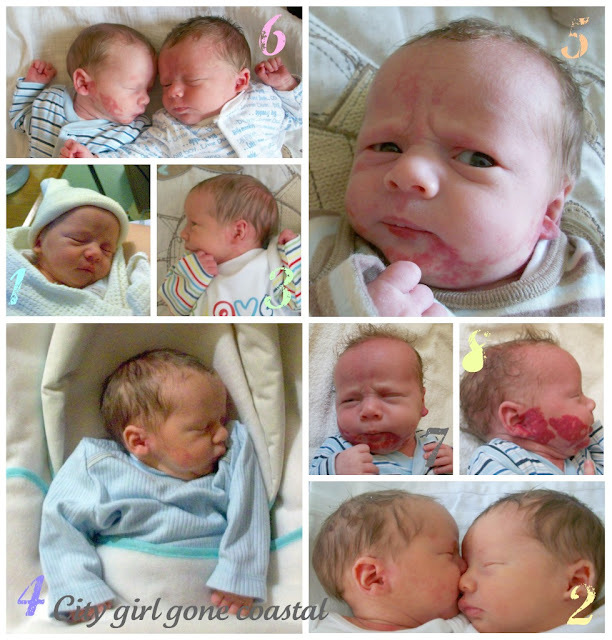 I'm not sure if it’s because the twins have just turned 3 and I'm reflecting on the past few years or because I get a lot of people coming to this blog looking for information regarding birthmarks, but I feel it’s time to maybe share a little more about it. 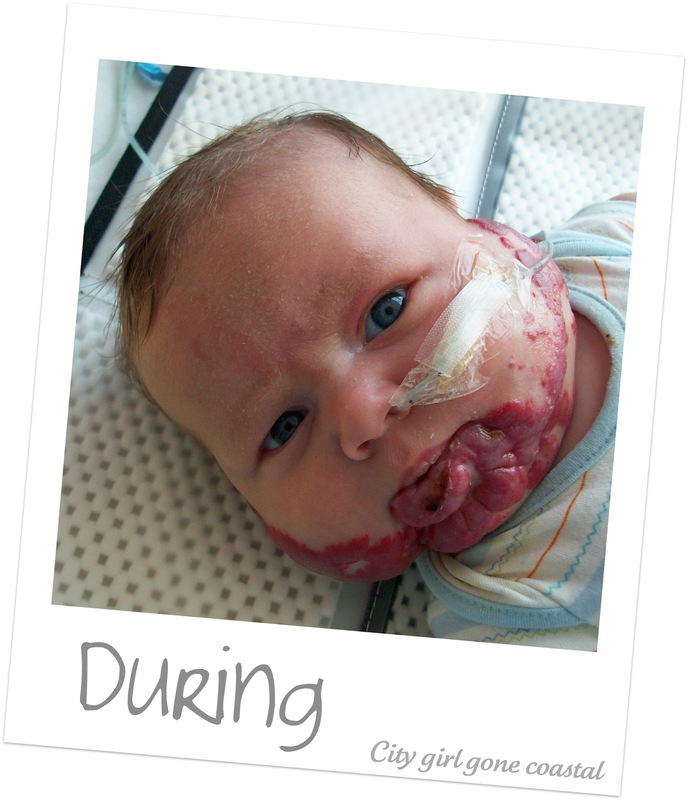 During this time, Ethan was just like any other baby, the birthmark was growing, but we didn't expect it to be anything other than a normal birthmark, haemangioma. These photos show the growth of the birthmark over the first month or so of Ethan's life. 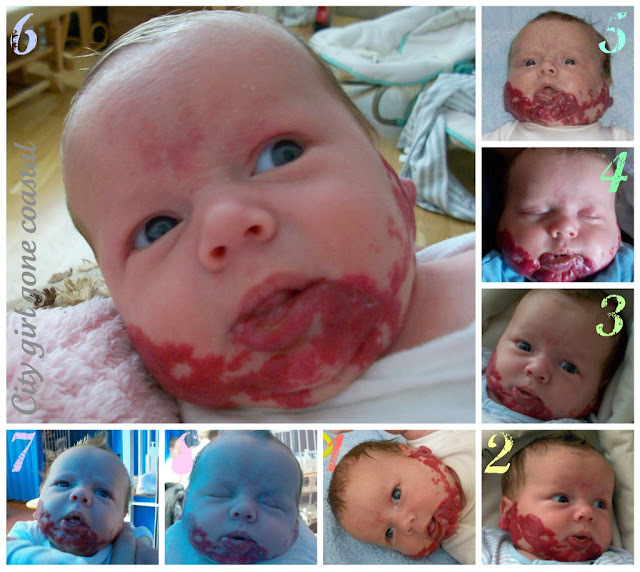 Photos 1 to 6 show the rapid growth of the birthmark over a few weeks. 7 and 8 are taken of Ethan's first visit to the Evalina Children's Hospital in London. 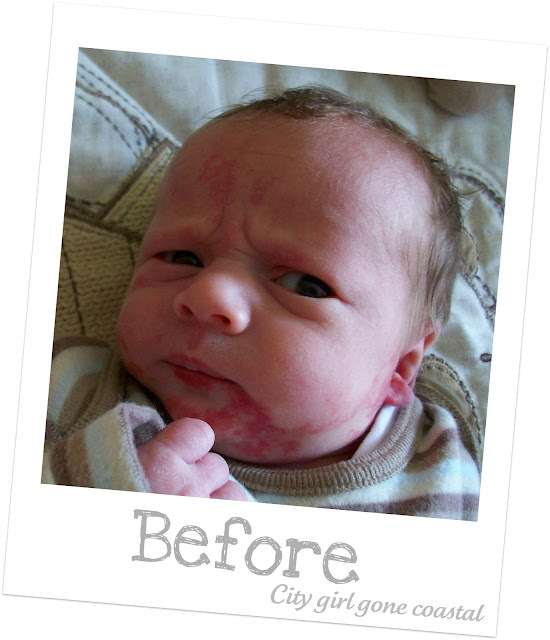 It was assumed the birthmark was okay, nothing serious! He was discharged back home, but the situation quickly went from bad to worse. Eventually we realised it was more than a normal birthmark. He was in constant pain, no longer able to feed properly and his breathing was being hindered. His ears were becoming sealed up. 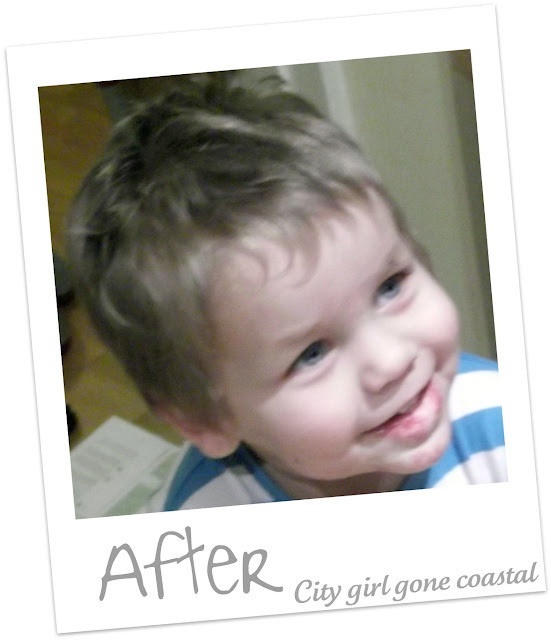 He was no longer his chirpy little self. You can see where his lip was being torn away and infected. 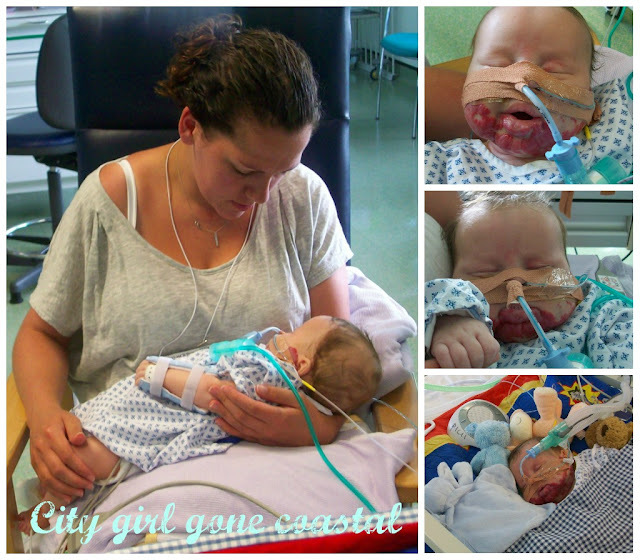 I was beyond pissed off when we found out a nurse had given him a dummy to stop him crying during the night, it tore off more of his lip, WTF! Our general hospital didn't feel they could treat him, so a bed was again found at the Evalina Children's Hospital. Once in London, he was transferred to the High Dependency Unit, photo 2 was taken the morning of his first surgery. I was really hoping this wouldn't be the photo we got of our baby, those few hours were some of the longest and most terrifying of my life. We went for a walk up the Thames whilst he was in surgery (waiting in the hospital would have driven us crazy), its the most crazy thing that the rest of the world was carrying on as normal, people went about their day whilst we were waiting to find out if our child would survive surgery. What's even more crazy, is that we looked just like any other couple taking a stroll, no one knew that on the inside we were falling apart. After his first surgery he was admitted to the Paediatric Intensive Care Unit. His condition was worse than expected, he almost didn't make it through surgery. They discovered that a birthmark was growing inside his windpipe, subglotic haemangioma. 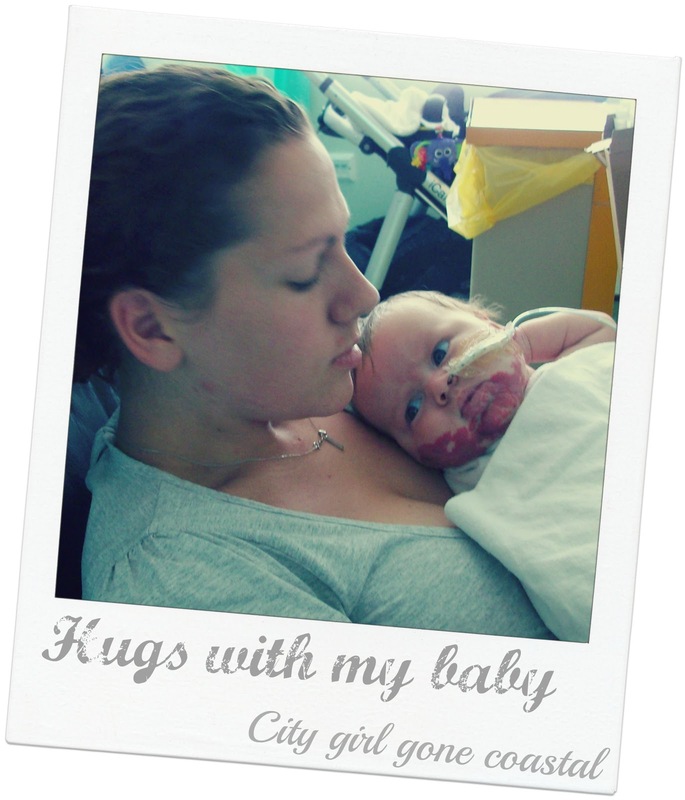 I can't say enough good things about PICU and the amazing staff that work there. Each patient had their own nurse who literately sat with them throughout their entire shift. They are amazing at encouraging and keeping parents positive. One of the worst things was not being able to hold him, there were so many wires and tubes we had to ask when it was okay. Asking for permission just felt so wrong. Over the next month Ethan had a whole bunch of surgeries. He was hooked up to so many machines, had numerous wires and tubes that eventually he had to have his arms put in splits to stop him pulling them out. He had more drugs pumped into his little body than I’ve had in my life. Eventually the surgeons said any more surgery would cause even more problems and if he couldn't breath on his own a tracheostomy would be needed. He was taken off the machine helping him breath, and we waited. He was popped in a little blue chair, the positioning would help open his airway and given some puffs on the nebuliser. The whole time I kept an eye on the numbers on the monitor he was hooked up too, praying they wouldn't go to low or to high. Poor Ethan didn't know what was going on, so many people were stood around him, watching the monitor, ready to swoop in if necessary. The next few days were touch and go, for a week he was given some extra oxygen, it took a lot out of him, but he was determined to do it on his own. It was such a relief when he started sucking on my finger, he had been fed through a tube for so long we were warned he might have problems feeding. He was not a happy baby having his milk pushed through a tube! Gradually it became clear that the drugs were working and he could once again breath unaided. He was even starting to smile. 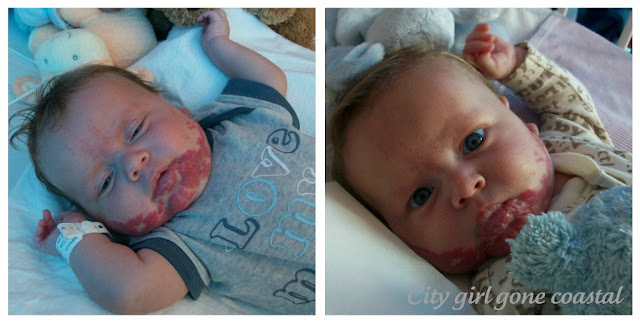 Seeing the difference in his birthmark was truly amazing, almost every day you could see an improvement. 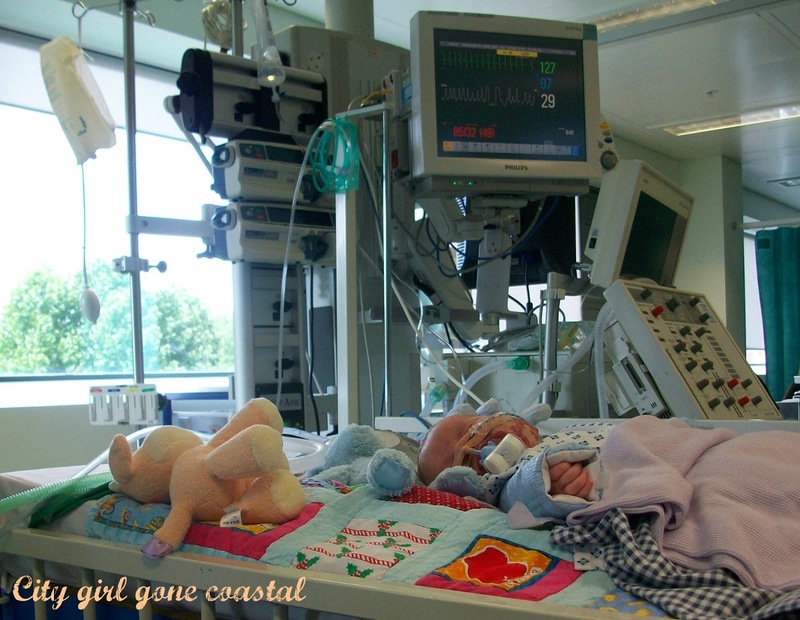 He was eventually moved out of PICU and into a regular ward. It was such a great day when he was tube free! It was an awesome day when they signed the paper work to let him come home, happy days indeed! Back at home both Ahren and Ethan were reunited, it was so nice to see them back together. We were worried that there might be some issues as they had been separated for so long. He's been back to hospital a few times for surgery to reduce scaring in his windpipe, which all went well. We've had a few scares, I think we will always be somewhat over protective. Ethan keeps disproving all our concerns, growing into a healthy little boy. Whilst it’s not over yet, he may still need plastic surgery, his hearing is somewhat affected and virus’s can impair his windpipe, he is home, and thriving. 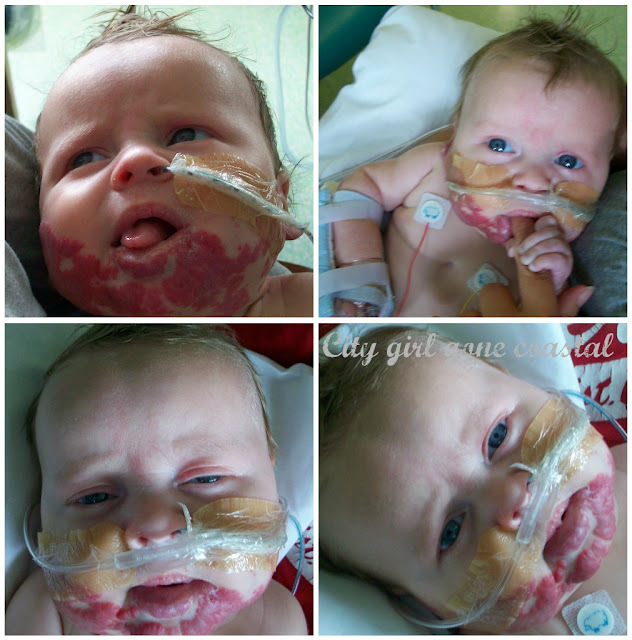 I know some of these photos aren’t all that nice to look at, who wants to see any child in pain, but for anyone else going through similar, it shows that it can and does get better. 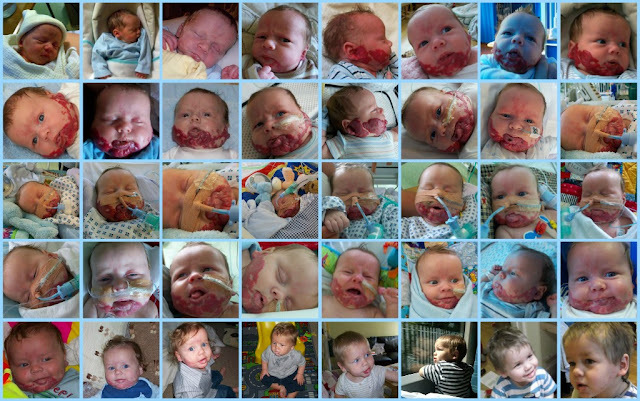 We met so many professionals who didn't realise the dangers of the type of birthmark Ethan has, it was scary that those you look up to and expect to know everything, were just as clueless as us. Ethan is such a strong and determined little boy, perhaps somehow we knew he would be, before he was born we chose his name, Ethan Hale, which means strong hero. There is a lot more to this story, which I will put down here soon enough. I like to think that maybe we went through such a crappy experience so that we can maybe help others. Ethan was the 2nd person to undergo this new treatment, which is now widely used to treat birthmarks such as this, thanks to him, maybe other parents and children don't have to have such a crap time. I am so sorry for the worry and pain that your family had to endure. You have a truly amazing family. I have never gone through something like this before, but I'm sure the families that have will find comfort in your story. I think it shows so much of you and your family's character to share your story. Have a wonderful Easter enjoying those little boys. I'm reading your story this Easter morning and I'm sitting here in tears. What am amazing experience, I forget how blessed I am to have healthy kids. I love your story, it is so moving, you are a strong woman. 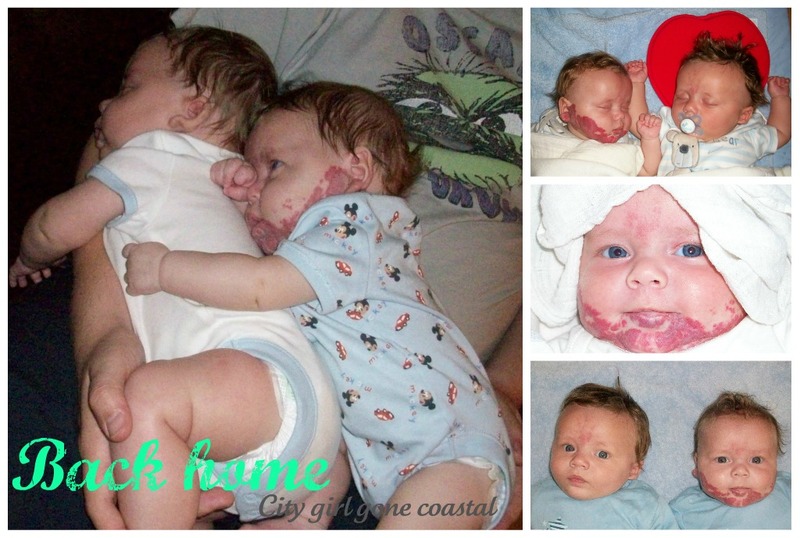 Your sons are beautiful - I had no idea a birthmark could be such a big deal. Ethan is a marvellous little boy and his name is very fitting. Thank you for sharing your story. I had no clue that birthmarks could be dangerous. I especially related to the part where you talked about taking a walk and how odd it is when the rest of the world is chugging along like normal while you wait for surgery to end. I feel the exact same way whenever I'm in the hospital with my son. Wow. I have a almost 2 yr ol daughter named Camryn. She is the light of my life. Seeing tour little ethan has touched me eart deeply. God has blessed me so much and seeing this does nothing but remind me of that. 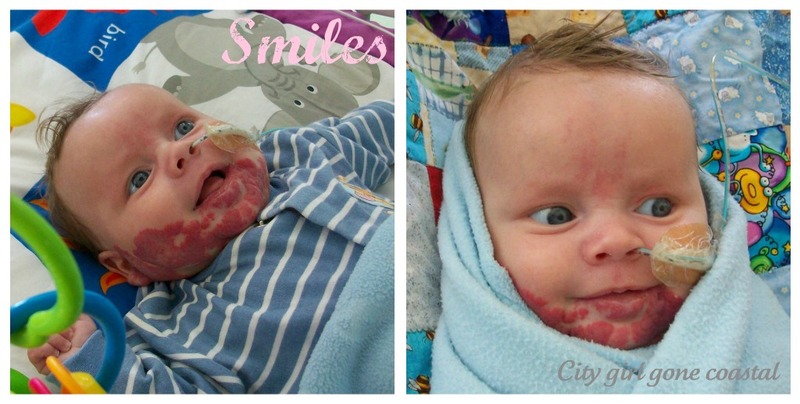 Ethan is a little miracle. You are such a strong lady for posting this. God bless you and your family. Your boys are absolutely precious. I wish you nothing but the best in your sons future. ~Brooke from GA please feel free to email me at annabrooke06@aol.com if you ever need to talk! Hi Amanda, I was sure I left a comment this week when I read of your journey with you cute little twin son, but I see that I hadn't. I wanted to make sure you knew that I am so appreciative that you shared this as I had no idea. How scary this had to be for your family!Sending hugs to you and hoping that your son continues to heal and grow and keep you on your toes! Your post was the most viewed from last weeks Sunday Blog Love. In fact, your post was the most ever viewed ever for my blog party. I just wanted to let you know how much I appreciate your friendship and your willingness to share something so personal. Wishing you a wonderful weekend!! I had no idea that birthmarks could cause this kind of damage to the inside of the body. Thanks for sharing and I can only pray for Ethan's continued healing and thank God for a mommy that did something about it when in your gut you knew something was wrong. Blessings to you and your beautiful family! Thank you so much for sharing your story. Your boys are beautiful! I have read your families story with tears in my eyes. You are all so strong, I'm not sure I could have coped the way you did. Ethan is such a beautiful little boy and I'm so glad things turned out the way they did. I had no idea birth marks could be so dangerous, I suppose it's because you don't see many these days? Thank you for opening my eyes to something I wouldn't have otherwise known about. 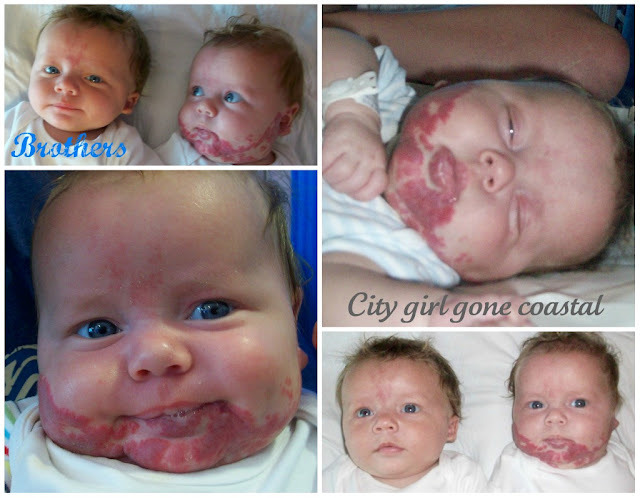 I had no idea that birthmarks could cause this kind of damage. What a brave little boy you have! Thank you for sharing your story. I have one month old twin boys. One of my boys was just admitted to the childrens hospital for his strawberry hemangiomas. Whereas his brother is fine. It was very refreshing to read your story! It gave me a,lot more positive outlook on his situation.